A dental crown is a replacement for the portion of the tooth that is visible. Also called a cap, it runs down to the gum line and protects the dentin, the very sensitive roots and inner gum area. Another function of the crown is that it allows you to chew your food, as it’s the surface that makes contact with what you consume. What Happens When Your Crown is Damaged? You and your dentist will discuss which option is best based on your specific needs. The crown is usually installed in a two-step procedure, where the first visit with your dentist in Annapolis involves any corrective procedure you may need to be done like a root canal or dental filling. While you’re there, your local professional will place a temporary crown and take impressions of your tooth to send off to a lab. Then, at the next visit your fabricated crown will be permanently placed. After a brief period of adjustment, your new crown will function as normal and you’ll be able to get back to the regular activities of your life. 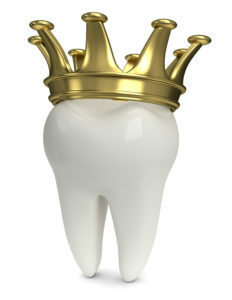 Your new crown requires the same care as the rest of your teeth. That means that you should brush and floss around it to remove any harmful bacteria and food debris that can get trapped. So you’re now set to get back to business as usual, but don’t forget to maintain semi-annual visits with your Annapolis dentist for thorough cleanings and examinations. This along with practicing excellent oral hygiene will ensure a longer life for your new application. Dr. Earl Chambers received his undergraduate degree from St. Mary’s College and then went on to earn his Doctor of Dental Surgery degree from the University of Maryland Baltimore College of Dental Surgery. Since then he has been serving the Annapolis area for over 20 years. He practices at Chambers Family Dentistry and can be reached for more information through his website.